For other uses, see Chukotka. 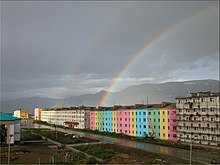 Anadyr is the largest town and the capital of Chukotka, and the easternmost settlement to have town status in Russia. 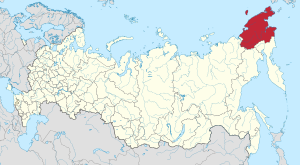 Chukotka is bordered in the north by the Chukchi Sea and the East Siberian Sea, which are part of the Arctic Ocean; in the east by the Bering Strait and the Bering Sea, part of the Pacific Ocean; in the south by Kamchatka Krai and Magadan Oblast; and in the west by the Sakha Republic. The Chukchi Peninsula projects eastward forming the Bering Strait between Russia and the United States ( Alaska), and encloses the north side of the Gulf of Anadyr. The peninsula's easternmost point, Cape Dezhnev, is also the easternmost point of mainland Russia. Anadyr River, with tributaries Belaya, Tanyurer, and Velikaya Rivers, as well as the Avtatkuul River, which flow east to the Gulf of Anadyr. Omolon and the Great and Little Anyuy Rivers that flow west into the Kolyma River in Yakutia (Sakha). Rauchua, Chaun, Palyavaam, Pegtymel, Chegitun and Amguyema Rivers that flow north into the arctic seas. The largest lakes are Lake Krasnoye, west of Anadyr, and Lake Elgygytgyn in central Chukotka. The okrug's extensive coastline has several peninsulas, the main ones being the Kyttyk Peninsula, Cape Shelagsky, the Aachim Peninsula, the Chukchi Peninsula and Russkaya Koshka. There are also several islands belonging to Chukotka, from west to east the main ones being Ayon Island, Ryyanranot Island, Chengkuul Island, Mosey Island, the Routan Islands, Shalaurov Island, Wrangel Island, Herald Island, Kosa Dvukh Pilotov Island, Karkarpko Island, Kolyuchin Island, Serykh Gusey Islands, Idlidlya Island, Big Diomede Island, Ilir Island, Arakamchechen Island, Yttygran Island, Merokinkan Island, Achinkinkan Island and Kosa Meechkyn Island. Chukotka's climate is influenced by its location on the three neighboring seas: the Bering Sea, the East Siberian Sea, and the Chukchi Sea. The weather is characterized by cold northerly winds that can quickly change to wet southern winds. Cape Navarin has the highest number of hurricanes and storms in Russia. The coastal areas are windy with little precipitation, between 200 and 400 mm per year. Temperature varies from −15 °C (5 °F) to −35 °C (−31 °F) in January and from +5 °C (41 °F) to +14 °C (57 °F) in July. Growing season is short, only 80 to 100 days per year. The first inhabitants were Paleo-Siberian hunters who came to Chukotka from Central and East Asia. The area was then part of the Beringia land bridge that is believed to have enabled human migration to the Americas. Traditionally Chukotka was the home of the native Chukchi people, Siberian Yupiks, Koryaks, Chuvans, Evens/ Lamuts, Yukaghirs, and Russian Old Settlers. After the Russians conquered the Kazan and Astrakhan Khanates in the 16th century, the trade routes to the Urals, Siberia, and Central Asia opened for travel and traders and Cossacks moved eastwards. The Cossacks built forts in strategic locations and subjected the indigenous people to the Tsar. 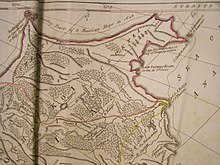 During the first half of the 17th century, Russians reached the far north-east. 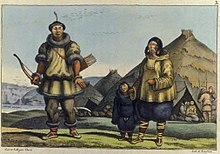 In 1641, the first reference to Chukchi people was made by the Cossacks. In 1649, Russian explorer Semyon Dezhnyov explored the far north-eastern coast and established winter quarters on the upstream portion of the Anadyr River that became the fortified settlement of Anadyrsk. Dezhnyov tried to subjugate the Chukchi and exact tribute during the next ten years, but was mostly unsuccessful. Eventually the fort was abandoned because of the harsh northern conditions and lack of game animals for food. At the end of the 17th century, the fort regained some importance when the sea route from Anadyrsk to Kamchatka was discovered. It was used as the staging base for expeditions to Kamchatka and all other forts and settlements were made subject to Anadyrsk. When the wealth of Kamchatka's natural resources was discovered, the Russian government started to give the far north-eastern region more serious attention. In 1725, Tsar Peter the Great ordered Vitus Bering to explore Kamchatka and Afanasy Shestakov to lead a military expedition to subjugate the Chukchi. This expedition failed when the fleet suffered shipwreck and the survivors, including Shestakov, were killed by the Chukchi. In 1731, Dmitry Pavlutsky tried again, aided by Cossacks, Yukaghirs, and Koryaks (indigenous Siberian tribes that were subjugated earlier). Pavlutsky sailed up the Anadyr River and destroyed the Chukchi garrison on the Arctic Ocean. His ruthless methods had some limited success in forcing tribute from some Chukchi. But in 1747, the Chukchi defeated the Russian regiment and killed Pavlutsky. Realizing that the Chukchi could not easily be subjugated by military means, the Russians changed tactics and offered the Chukchi citizenship in the Russian Empire. A peace treaty was concluded in 1778 in which the Chukchi were exempted from paying yasak. That same year, British Captain James Cook made an exploration of Cape North (now Cape Schmidt) and Providence Bay. Anxious that European powers would occupy the area, Tsaritsa Catherine II ordered the exploration and mapping of the area. Starting in 1785, an expedition led by Joseph Billings and Gavril Sarychev mapped the Chukchi Peninsula, the west coast of Alaska, and the Aleutian Islands. Then from 1821 to 1825, Ferdinand von Wrangel and Fyodor Matyushkin led expeditions along the coast of the East Siberian Sea and explored the Kolyma, Great Anyuy, and Little Anyuy Rivers. Chukotka remained mostly outside the control of the Russian Empire and consequently other foreign powers (American, British, Norwegian) began to hunt and trade in the area from about 1820 onwards. After the sale of Alaska to the United States, American whalers and traders especially extended their activities into Chukotka and foreign influence reached its peak. By 1880, the Russians reacted by setting up coastal patrols to stop American ships and confiscate their property. And in 1888, the administrative region of Anadyr was created. Yet Russian control diminished again and around 1900, a large stream of foreigners entered Chukotka, lured to the region by the Yukon gold rush in 1898. In 1909, in order to keep the region within Russian control, two districts were created within the Anadyr Region: the districts of Anadyr and Chukotka. The Russian government granted concessions to foreign companies such as the Hudson's Bay Company and the US Northeast Siberia Company, which was granted gold, iron, and graphite mining rights in the entire Chukotka between 1902 and 1912. Wrangel Island in particular was subject to claims by the United States and Canada. In 1916, the Russians officially claimed the uninhabited island. But in 1921, Canadian Vilhjalmur Stefansson made a serious attempt to claim it for Canada by populating it and building a small settlement. Another contingent arrived in 1923 but a year later, the Soviets permanently conquered the island, removing the remaining inhabitants, and thereby ending all foreign influence. From 1919 onwards, the region was subject to collectivization and resettlement of the indigenous people. When Nazi Germany attacked the Soviet Union in 1941, everything was done to start tin production as quickly as possible in Chukotka. Mining rapidly developed, and this industry would become its economic base. Also during the war, geologists discovered large reserves of gold that would be mined in the 1950s. In 1977, Chukotka became administratively subordinated to Magadan Oblast. In 1991, Chukotka declared its separation to become a subject of the Russian Federation in its own right, a move that was confirmed by the Constitutional Court of the Russian Federation in 1993. Chukotka has large reserves of oil, natural gas, coal, gold, and tungsten, which are slowly being exploited, but much of the rural population survives on subsistence reindeer herding, whale hunting, and fishing. The urban population is employed in mining, administration, construction, cultural work, education, medicine, and other occupations. Chukotka is mostly roadless and air travel is the main mode of passenger transport. There are local permanent roads between some settlements, for example Egvekinot- Iultin (200 km). When cold enough, winter roads are constructed on the frozen rivers to connect regional settlements in a uniform network. The Anadyr Highway is under construction to link Chukotka to Magadan, and to connect the settlements of Anadyr, Bilibino, Komsomolsky and Egvekinot within Chukotka. In 2009, replacement of the emergency bridge through Loren River on the busy local road from Lavrentiya to Lorino (40 km) became the main event in transport in Chukotka. The main airport is Ugolny Airport near Anadyr. Coastal shipping also takes place, but ice prevents this for at least half the year. Along the Arctic coast (from west to east): Bilibinsky District (northwest), Chaunsky District around Chaunskaya Bay, then Iultinsky District, and finally Chukotsky District at the eastern cape. Along the Pacific coast (from north to south): Providensky District south of Chukotsky, southern Iultinsky District around Kresta Bay, and finally eastern Anadyrsky District at the Anadyr Estuary. Interior: The western quarter of the Okrug is Bilibinsky District and the rest of the interior is Anadyrsky District. Population: 50,526 ( 2010 Census);  53,824 ( 2002 Census);  157,528 ( 1989 Census). The Chukotka Autonomous Okrug is one of the very few places in Russia where there are more men than women. The Russian Orthodox Church in Chukotka is represented by the Eparchy (Diocese) of Anadyr and Chukotka ( Russian: Анадырская и Чукотская епархия). The controversial conservative Bishop of Anadyr and Chukotka, Diomid, who had occupied the Anadyr see since 2000 and had been instrumental in the development of the church in the peninsula, was removed by the Holy Synod in the summer of 2008. The diocese has been since run by the archbishop of Khabarovsk and the River, Mark (Tuzhikov) ( ru). ^ Госстандарт Российской Федерации. №ОК 024-95 27 декабря 1995 г. «Общероссийский классификатор экономических регионов. 2. Экономические районы», в ред. Изменения №5/2001 ОКЭР. ( Gosstandart of the Russian Federation. #OK 024-95 December 27, 1995 Russian Classification of Economic Regions. 2. Economic Regions, as amended by the Amendment #5/2001 OKER. ). ^ Smale, Will (September 29, 2005). "What Abramovich may do with his money". BBC News. Archived from the original on April 6, 2009. Retrieved May 22, 2010. ^ Shaun Walker (July 4, 2008). "Abramovich quits job in Siberia to spend more time on Western front". The Independent. London: Independent News and Media Limited. Archived from the original on July 5, 2008. Retrieved July 4, 2008. ^ "Abramovich's successor in Far East named". RussiaToday. July 13, 2008. Archived from the original on January 28, 2012. Retrieved September 27, 2008. ^ Map 3.6 (Chukotskiy Avtonomnyi Okrug) Archived March 19, 2009, at the Wayback Machine from the series prepared for the INSROP (International Northern Sea Route Programme) Working Paper No. 90 Archived July 21, 2009, at the Wayback Machine in 1997. Дума Чукотского автономного округа. Закон №45-ОЗ от 4 октября 2000 г. «О гимне Чукотского автономного округа», в ред. Закона №99-ОЗ от 7 ноября 2016 г «О внесении изменений в Закон Чукотского автономного округа "О гимне Чукотского автономного округа"». Вступил в силу со дня официального опубликования. Опубликован: "Крайний Север", №2 (1243), 12 января 2001 г. 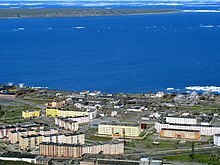 (Duma of Chukotka Autonomous Okrug. Law #45-OZ of October 4, 2000 On the Anthem of Chukotka Autonomous Okrug, as amended by the Law #99-OZ of November 7, 2016 On Amending the Law of Chukotka Autonomous Okrug "On the Anthem of Chukotka Autonomous Okrug". Effective as of the day of official publication.). Дума Чукотского автономного округа. №26-ОЗ 28 ноября 1997 г. «Устав Чукотского автономного округа», в ред. Закона №33-ОЗ от 5 мая 2015 г. «О внесении изменений в Устав Чукотского автономного округа». Вступил в силу со дня официального опубликования. Опубликован: "Ведомости", №5, 19 декабря 1997 г. (Duma of Chukotka Autonomous Okrug. #26-OZ November 28, 1997 Charter of Chukotka Autonomous Okrug, as amended by the Law #33-OZ of May 5, 2015 On Amending the Charter of Chukotka Autonomous Okrug. Effective as of the day of the official publication.). Всероссийский центральный исполнительный комитет. Постановление от 10 декабря 1930 г. «Об организации национальных объединений в районах расселения малых народностей Севера». ( All-Russian Central Executive Committee. Resolution of December 10, 1930 On the Organization of the Ethnic Clusters in the Areas of Settlement of the Small-Numbered Peoples of the North. ). Wikimedia Commons has media related to Chukotka. Wikivoyage has a travel guide for Chukotka.